Renaissance bronze registers are strong enough to use in your floor, wall or ceiling. The louvered wall vent will come with pre drilled screw holes, if so desired, and screws to make installation easy. Our bronze registers are sand cast with a 1/4" thick faceplate and are made by hand. These louvered wall vents are designed by Classic Grilles, which is located in the United States. Be sure to order according to the measurement of your duct opening. Select the bronze register in your choice of light, dark or antique patina and see what a beautiful warmth it will add to your decor. Louvered wall vents have a steel diffuser attached at the back of the faceplate and is adjustable for controlled airflow. Tip: These bronze registers should be ordered according to your hole opening measurements in the wall or floor. The louvered wall vents will have an additional 2 inches added to the faceplate but can vary because each one is handmade. Important: Once the louvered wall vents are ordered, they are considered non returnable, special items that cannot be canceled once payment is received. Allow 7 to 9 weeks for the registers to ship and be delivered since they will have to be made. These bronze registers can also be purchase as a return air vent which will just have a screen backing instead of a diffuser. 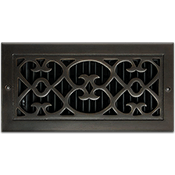 Classic Grilles louvered wall vents come in a variety of designs for all homes and styles. Get your bronze registers now to replace all your traditional and outdated wall vents.